Device Implants, no matter how small need the proper attention. 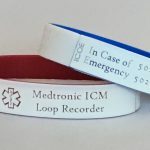 Defibrillator, Loop Recorder, Stents or any other type of implanted device that you may have should be called out to EMT’s – In Case of an Emergency! Defibrillators are kind of large but you can’t assume an EMT knows you have one if you need immediate medical attention. Heaven forbid an EMT tries to give you the paddles not knowing you have a defibrillator – it could totally void the desired result. Stents are invisible so unless you alert emergency medical personnel you have one, they could perform some activity that interferes. Stents may not be a problem depending on what they’re made of. But if you need an MRI, they could pose a problem. A medical bracelet that notes the type of implant you have is a must. You should be able to include any other critical medical information emergency personnel would need to know to best treat you – like prescriptions. First hand experience is not the best way to learn but I’ve been there. With a loop recorder in my chest, the ER nurse promptly said “who makes it”! She needed that to be able to get the correct reader to finish her health analysis. I’m glad we have the devices! I know at least one person wearing them all and have made many bracelets with all sorts of medical device and instructions on them. Just be sure to be wearing one when emergency personnel need it.